NAWANSHEHAR, Punjab—Following the “Vangar March” in Beas by Sikh Jathebandis against Shiv Sena and right-wing Hindu organizations, the Punjab Police is cracking down on Sikh Youth. Police is using pictures on social media to identity most active Sikh youth in order to arrest them. 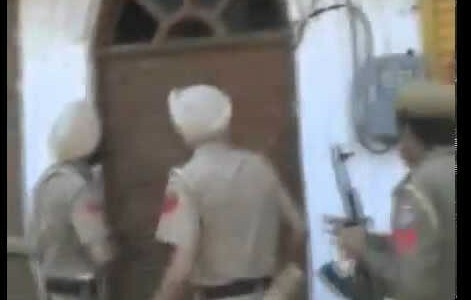 Earlier today, May 27, Sikh24 has confirmed that the Nawanshehar police have arrested an innocent Sikh youth by alleging that he is associated with Babbar Khalsa. The accused Sikh youth, Bhai Arvinder Singh, is originally from village Pallian Khurd. However, for the last six years, he has lived in Doha, Qatar. Family members informed Sikh24 that Bhai Arvinder Singh had come back to Punjab two months ago and was preaching Sikhi among youth. The police alleged that he was instigating the public against India. After producing him before the Court, the police got him remanded until May 30, 2016. Police have alleged that Arvinder Singh has planning to target anti-Sikh cults in Punjab. Another Sikh youth named Mandeep Singh from Jagraon was also rounded up by the local police. Mandeep Singh is a Canadian Sikh and returned to Punjab for a brief travel.